Bike racks come in a variety of types from a roof rack carrier, tray- or hanging-style hitch racks, trunk mounted, spare-tire mounted and recently an innovative trunk-mounted rack which combines the loading of a hitch-mounted system and a trunk-mounted tray-style system. With the many different types of bike racks available, choosing one can be overwhelming. Our testers have performed extensive field tests on several styles of bike racks and rated them based on objective criteria to determine pros and cons of each type. When selecting a bike rack, there are different features to consider. 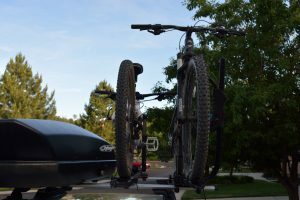 Trunk mount racks may be the most inexpensive and convenient type of rack, but it may not be the best rack to choose if transporting more than two heavier bikes, and security of the actual rack can be a bit sketchy. Roof racks don’t obstruct the view of the driver when bikes are loaded, and you can choose from a few different types of carriers to install, depending on how much space you have on your crossbars. Roof racks are best suited for those who have no issues with lifting the bikes overhead to load on the roof (or who don’t have a garage to drive into with the bikes still on top). Hitch mount racks might be a bit bulkier and more expensive, but they’re also the easiest to use when it comes to loading/unloading bikes. 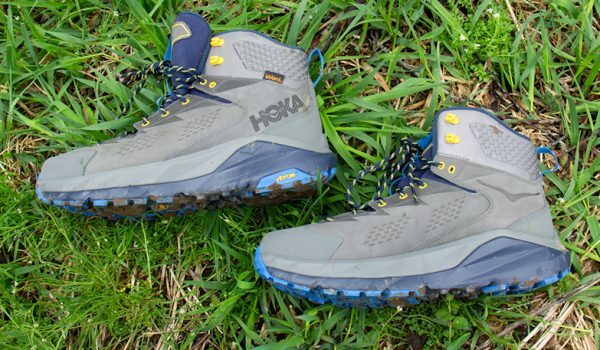 They also free up more space on the roof if you want to carry a cargo box or other outdoor gear such as a kayak or skis. Spare tire racks are for those with a spare tire bracket on the rear of their vehicle and are only looking to carry a maximum of two bikes. 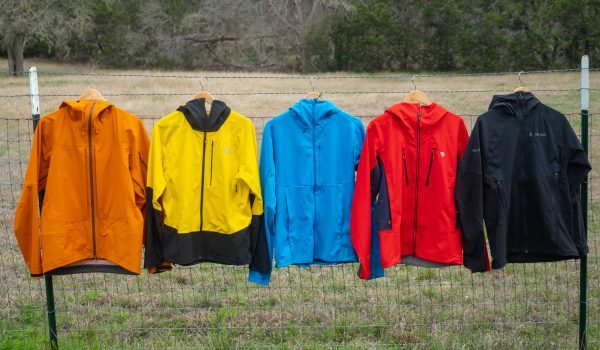 RockyMounts SplitRail was by far the favorite of the racks tested. It is the easiest to use both in terms of getting the rack on and off the vehicle, as well as to operate once on the vehicle. Mounting and retrieving bikes from the rack is pretty standard for these sorts of racks. The only improvement wished for was for the joints to be a little tighter to completely eliminate wobble. 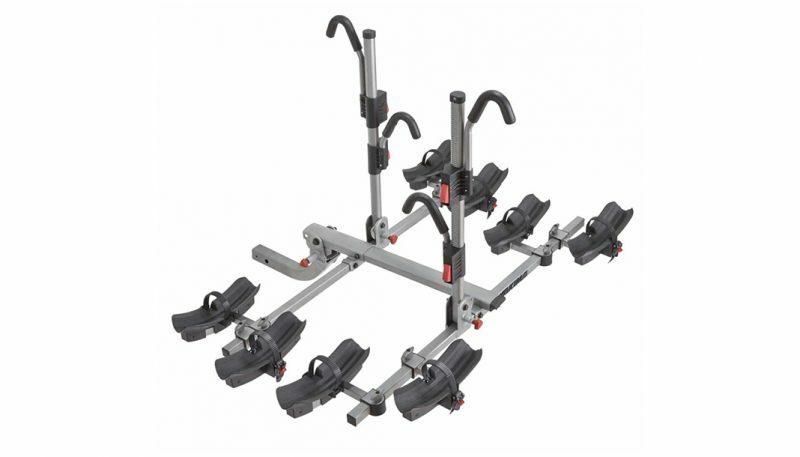 The Rhino Rack Dual Trekker is a solid bike rack. With the most stable folding joints, it has the potential to be the most stable save for the standard screw-in hitch-pin securing system. The Dual Trekker is one of the few racks that comes with a bike lock system included and it provides the most room for rear vehicle access thanks to the generous tip-away range. 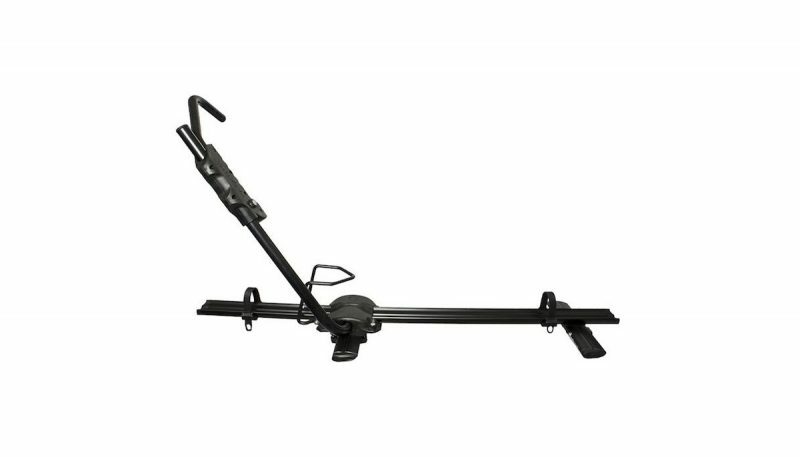 The Thule T2 Classic is a standard hitch style bike rack with few outstanding features. The bike rack does fold up nice and close to the vehicle but did not tip bikes back far enough for rear hatch access in our test scenario. The Yakima FourTimer is very adjustable to easily accommodates a number of bike types between one trip and another. It easily converts down to a two-bike carrier and is the only rack to clamp down on the top tube of the bikes instead of the front tire, which is good for fender bikes but not for sensitive carbon frames. It’s a fairly rickety rack because of so many adjustment points and is a touch more difficult to tip back once the bikes are loaded. 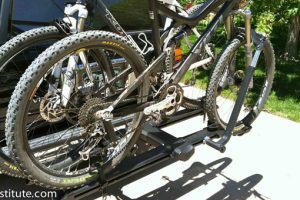 The Yakima HighSpeed was the easiest bike rack to install and for loading a bike out of all the racks that were tested. It proved to be one of the more versatile carriers in the test. 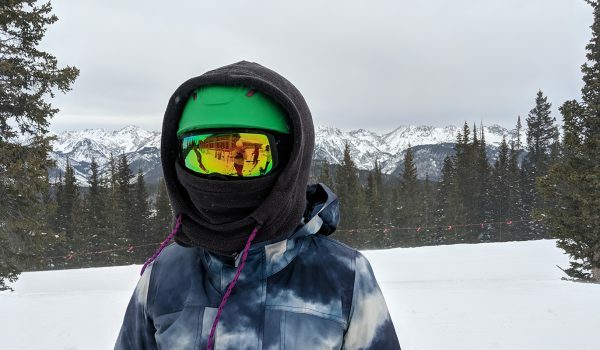 The thumbwheel is a bit difficult to maneuver with thick gloves on, so any adjustments of the carrier should be made with either liners or no gloves during the winter season. The skewer is a bit too short for bikes with thicker forks, so an adapter needs to be purchased. 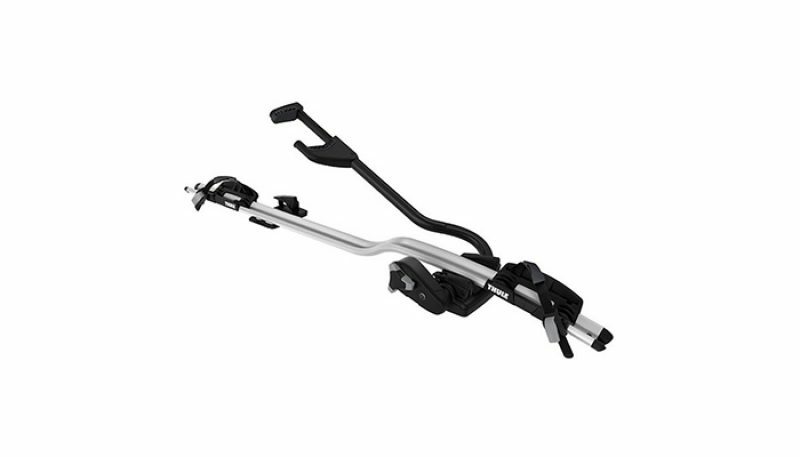 The ratchet arm on the Rhino-Rack Hybrid Bike Carrier is solid and doesn’t move around once it’s set in place. The wheel chock adds stability for the front wheel placement while loading the bike. Cushioning between mount and crossbar on back plate would’ve been nice to prevent wear on crossbars. 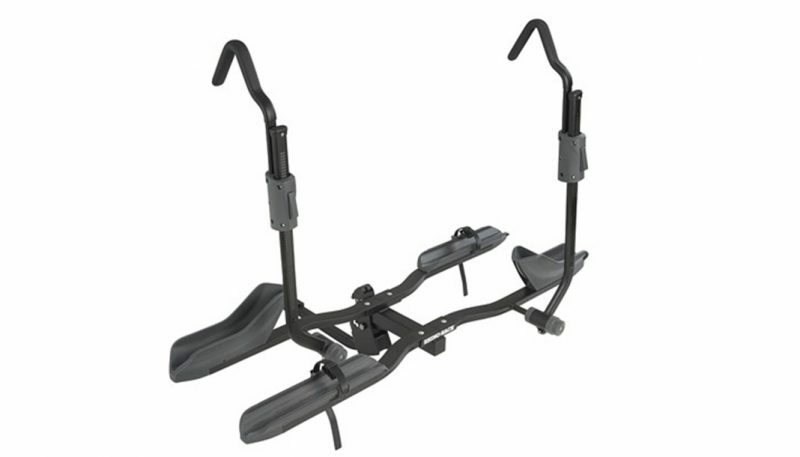 The RockyMounts TomaHawk upright mount was a good, sturdy rack with easy loading and unloading of bikes. The wheel chock contributed to the ease of loading. The ratchet hook over the front wheel is a nice feature to avoid bike frame contact. The main limitation of the TomaHawk was process of attaching it to the crossbars. 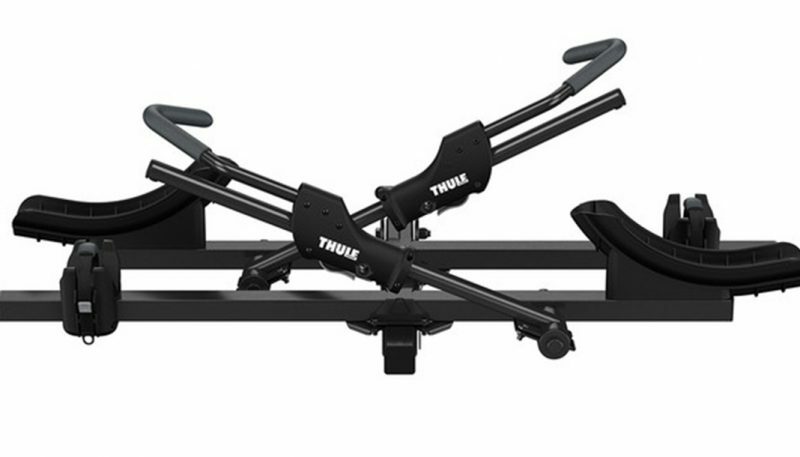 The Thule ProRide is a secure upright bike carrier with a safe-mount design that keeps the bike from falling while loading it in the carrier. Stability is firm while loading as the claw helps hold the bike in place, although it needs to be in just the right position for it to function properly. Pressure is evenly spread through the claw pads to avoid frame damage. It can be tricky to figure out which bike rack will be the best for you to buy. There are a few major factors that can help narrow your options. Consider what type of bike you’re riding, the vehicle carrying the bikes and whether you have a roof rack with cross bars, a hitch mount, or prefer to just carry the bikes via a trunk mount. From there, it becomes a choice of preference. Our five steps can help you sift through the options that work best for you. There are a few different types of bike racks available for the consumer. 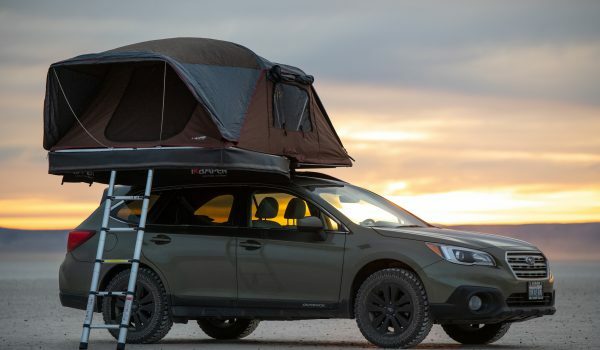 Determining factors in the style of rack you choose could all depend on the type of vehicle it’s being installed on, whether there’s a hitch installed, a roof rack, or no prior equipment at all to accommodate for a hitch-mount or roof rack bike carrier. In addition to the above-mentioned factors, there’s also the question of the different types of racks in each category (i.e. tray, stem and vertical hitch-mounts). Do you want to deal with removing a tire from the bike to load your bike on a fork mount roof rack? Are you willing to remove the bike rack several times to access your trunk with a trunk-mount rack and some hitch-mount racks? These are things to consider with the different styles of roof racks. Roof racks require the vehicle to have a base roof rack that can be factory installed or aftermarket. There are two styles: wheel-on/upright mount and fork mount. A fork mount requires the removal of the front tire of the bike to load it on the rack. The front-wheel fork of the bike is clamped down while the back tire is usually secured with a strap. Many fork mount racks now come with a skewer to settle the fork onto and then secure into a slot. If your bike has a thru-axle, that can be used to clamp down into a slot on the rack. There are also adapter kits available for different size forks. An upright or wheel-on mount is a rack that doesn’t require the removal of a tire to load. 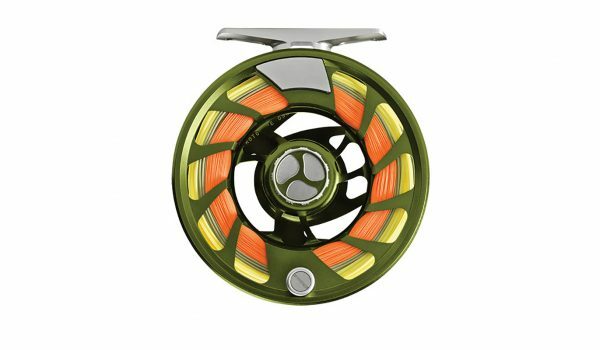 There are two different types of wheel-on racks: the frame mount and wheel-mount. A frame-mounted system clamps onto the frame of your bike to hold it in place. There are a couple of different types of wheel mounts. A sidearm-type wheel mount has a handle that ratchets into place on top of the front tire right next to the front fork of the bike. A wheel-hoop rack sets the front tire into a hoop-like feature that hugs the front tire and is tightened by a knob to secure it in place. 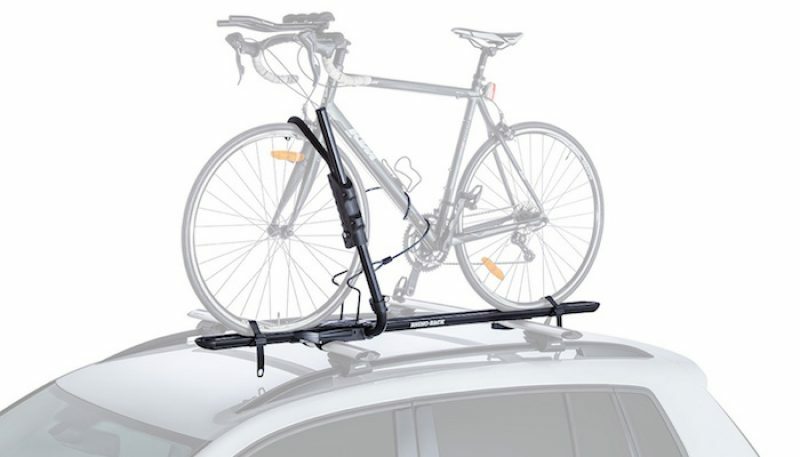 Roof-rack bike carriers require lifting the bikes overhead, and depending on how tall the car is, that can require a step stool or ladder. If you’re one to forget about loading things on the roof, chances are, the roof rack may not be your best bet, as you’ll risk driving into a garage and scraping the bikes off the top of the vehicle. Hitch-mount racks require the vehicle to have a receiver hitch installed, usually a 1 1/4 inch or 2 inch. While some vehicles might already have a hitch installed when purchased, make sure it’s capable of handling the load of a hitch-mount rack. Hitch mount racks are available in a platform/tray style, stem or hanging rack, and a vertical mount. A platform or tray-style mount holds bikes upright without dismounting the tires, and bikes are kept separate from each other. Bikes don’t need to be lifted very high to load or unload on this type of rack. Typically there’s an arm hook to hold the front tire or frame and the rear tire is held in place with a back strap. The stem or hanging rack consists of an arm that raises about chest level with two extending shorter arms to hold bikes. The bike slides on the arms through the frame and it is held in place with either rubber or Velcro straps, with some mounts having a clamp that attaches around part of the frame. Vertical mount racks work by hanging the bike vertically with their front wheels and handlebars turned which is held in place by a designated slot for each bike. For the bottom of the bike, there is a mini rope or cordalette that attaches the tire to the rack. There are also vertical mounts that have a top bar to slide the front tire onto, and a bottom bar with clamps to hold the bottom part of the bike in place. Hitch racks are one of the most popular options as the ease of loading is more enticing than dealing with any mishaps of a roof rack. Non-towing hitch mounts can be relatively inexpensive to install if your vehicle doesn’t already come with one. Keep in mind that some hitch mount racks do limit access to your trunk or hatch and may require removal of the rack. A spare-tire mount bike rack features a locking system to secure your bike to the rack, in addition to a lock that secures the rack to the tire. It should go without saying, but spare-tire mounts are only good for those that have a spare tire mounted on the back of the vehicle. 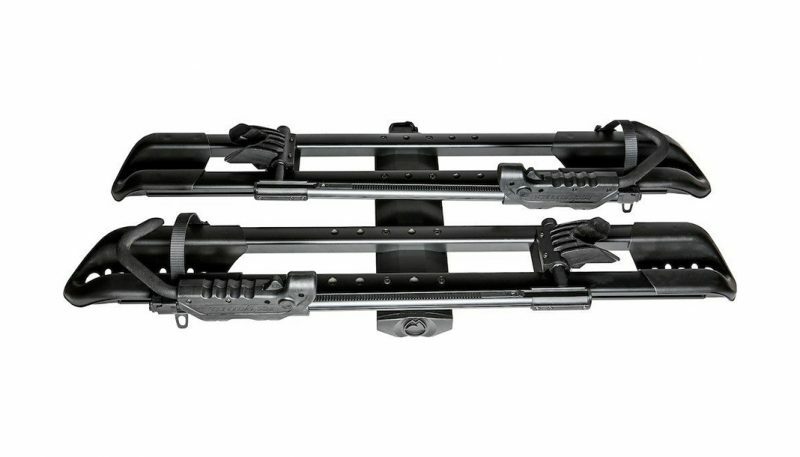 Trunk-mount racks rest on the trunk or back of your vehicle. It is held in place by straps, usually with rubber coated metal hooks, that connect to the trunk, hatch or bumper. Trunk mounts might seem more convenient than anything else as there’s no necessity for a hitch mount or roof rack, although they can interfere with access to the trunk. Each type of bike rack comes with its pros and cons. Trying to figure out those pros and cons before even purchasing a bike rack can prove difficult. How would you know what works and what doesn’t until you tested each type of bike rack? You can’t exactly go out and rent each type of bike rack and test it out for a few days at a time. That would also be extremely time consuming. 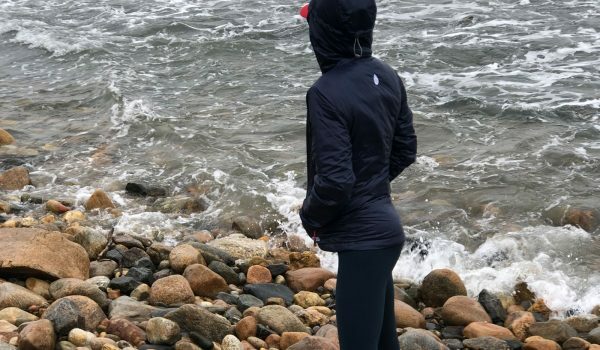 There are some common pros and cons with each type of bike rack that have been compiled by different testers and the types of things they encountered while using a certain bike rack. Browse through the following pros and cons for each bike rack to help decide the best rack for you. Pros: Roof racks spare you from adding length and extra bulk to your vehicle like a hitch mount would. Granted you do need a roof rack system with crossbars to install the roof racks, but at the same time, you can choose to go with any type of carrier from a frame mount, wheel-on mount or fork mount. Roof racks don’t obstruct road visibility and the access to your trunk or hatchback is not compromised. Roof racks can also be stored without taking up too much space. Cons: A roof rack can add additional noise and wind drag as the bikes are on top of the vehicle. If you want to go through a drive-thru, the added height of the bikes on the roof may not allow you to do so. Chances are higher that you’ll hit a low tree branch as well, and if you’re prone to out-of-sight, out-of-mind, it can be a major detriment to your bike should you try and park the car in the garage. Lifting the bike overhead to load onto the roof is required. Heavier bikes could prove to be more difficult to load. Pros: Loading and unloading bikes onto hitch mount bike racks are the easiest to do as the racks are lower to the ground. You don’t have to worry about height issues when going through a drive-thru, garage, or past any low hanging branches or signs. Wind drag and noise aren’t an issue with a hitch mount rack either. Cons: Hitch mounts can be very bulky and heavy. Your vehicle is required to have a receiver hitch installed before it can even be used, so if your car didn’t already come with a receiver hitch, that’s an added expense. You also need to make sure the hitch on your vehicle can handle the load of bikes you plan on carrying. Depending on the type of hitch mount you have, it can obstruct visibility to the rear of the vehicle including some back-up cameras. Some hitch mounts also block access to the trunk or hatch of the vehicle, so you have to uninstall it each time you want to gain access to the rear of the vehicle. Pros: Spare tire mounts are usually compact for easy storage. The rack doesn’t add a whole lot of extra weight to the car like a hitch mount would. Cons: A spare-tire mount only works if there’s a spare-tire bracket on the back of your vehicle. Most of these mounts have a two-bike limit, so if you need to carry more bikes, you may want to consider a different type of rack. There is the ability to add a hitch mount rack in addition to the spare tire rack, but it has to sit far enough back to clear the spare tire so that bikes can be loaded. Pros: Trunk mounts are one of the least expensive and most convenient types of bike racks. They are easily removed from the vehicle and don’t take up much space when storing. Cons: The security of trunk mounts can be questionable. If the hooks and straps aren’t properly installed they can become loose while driving. A trunk mount carries a maximum of two to three bikes. With some of these mounts, spacing between bikes can be compromised, so they lean up against each other, risking frame damage on more sensitive materials. You also need to be careful when installing a trunk mount as it is easier scratch or damage your vehicle. The number and type of bikes you plan on transporting with your vehicle may help determine the type of rack purchased. Many bike racks these days are made to be universal when it comes to carrying different types of bikes. But there are some that only carry a specific type of bike, like a mountain bike (North Shore vertical mount hitch rack). 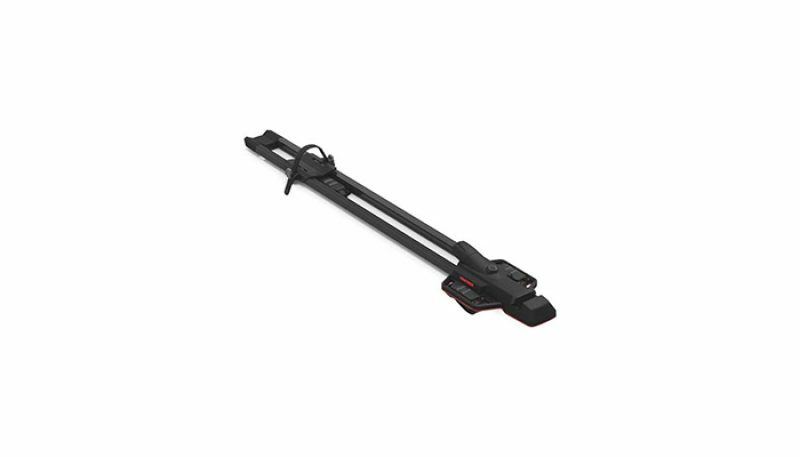 For roof racks, the space you have available on your crossbars will help you figure out how many roof rack carriers you’re able to install. Hitch mount racks can carry up to six bikes at a time. This will also depend on the weight of the bike. Enduro and downhill bikes tend to weigh more than your all-mountain or XC, so take the weight into consideration to determine how many bikes you will load on your rack. Always remember to check and make sure your hitch mount can carry the weight of the bikes plus the rack itself. Trunk-mount racks can usually carry up to three bikes, while spare tire mount racks carry a max of two bikes. The set-up of a bike rack can seem a little daunting once you have the rack out of the box. 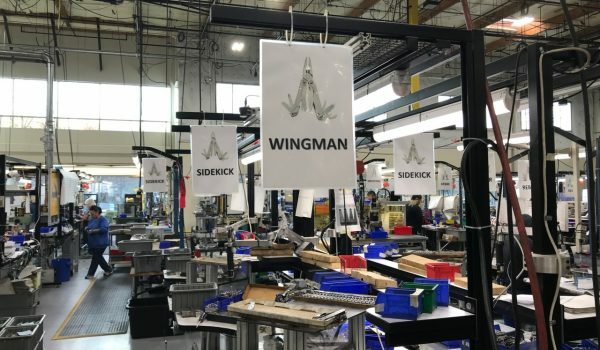 Some bike racks require more assembly than others while some are completely assembled at the factory and only require the installation on the vehicle. Just give yourself a good chunk of time for setup to assure it’s installed correctly. Features are a vital aspect to consider when purchasing any bike rack as you want to have the versatility to carry the bikes you own and the reassurance that the bikes are stable on your vehicle. A frame mount roof rack carrier has a claw-like arm that clamps down onto the frame of the bike when loading. The clamp needs to be in the upright position before loading the bike, and there’s usually a knob or dial that tightens the claw in place to clamp around the frame of the bike. Some of the frame mount racks raise concerns that the claw interferes with the water bottle holder of the bike. Damage to carbon-frame bikes is another concern for frame mounts. 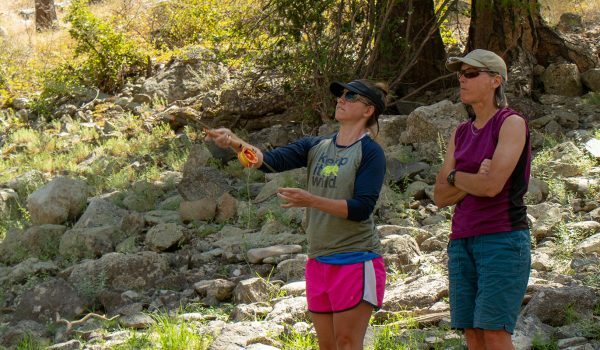 There are options for frame mounts that will not interfere with the water bottle holder, and the material for the claw on some carriers is gentle enough that frame damage isn’t an issue. A wheel-mount roof-rack carrier has a ratchet arm that swings over the front wheel and rests next to the front fork of the bike. This is a good alternative for those that have the above-mentioned concerns for frame mounts. A fork mount requires the removal of the front tire to load the bike either onto a skewer that sits in a slot to tighten to the rack, or if you have a thru-axle bike, you just replace the thru-axle and use that to sit in the slot to tighten on the rack. The fork mount is likely the most stable out of the three roof-rack bike racks, although if you’re short on packing space in the car, trying to figure out an area to pack the front tire without damaging it could prove to be challenging. Tray-style hitch-mount racks support the weight of the bike by placing it in a tray, and an arm swings over the front tire to keep the bike secure. It’s similar to the wheel-mount roof rack carrier. Tray style is one of the easiest to load and unload when it comes to bike racks. A hanging or stem-style bike rack requires one to hang the bike by the frame. 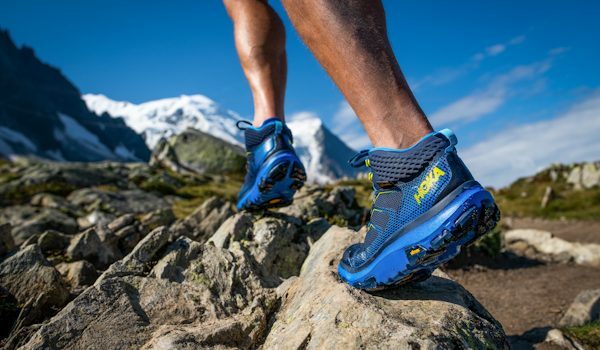 These become tricky with a full-suspension mountain bike or a bike that has an unusual frame as the arms may not fit through the frame to load it. Vertical-mount bike racks have become more popular. These bike racks stabilize the bike vertically by loading the front stem of the bike into a slot then attaching the bottom wheel to a bar below. There are also vertical mounts that slide the front tire onto a bar at the top while attaching the bottom tire to a clamp at the bottom. The bikes are then held into place by elastic cords or straps. There are some vertical mount racks that only hold a specific type of bike, so double-check to see if your type of bike is compatible with the rack. The trunk mount bike rack is one of the most inexpensive ways to carry bikes since it doesn’t require extra features such as a roof rack or a hitch mount. They are easily stored when not in use as you simply just remove the hooks that hold the rack to the car and fold it up. While it might be the most inexpensive rack to purchase, a trunk rack might not be the smartest choice as the security of the rack on the car can become an issue. The spare-tire mount is very limited for obvious reasons. With the load of the bike transmitted to a spare tire bracket, your vehicle must have the bracket for the spare tire to attach the rack. These racks usually only carry a total of two bikes, but like the trunk mount, these are easy to remove and don’t take much space to store. How much are you willing to pay for your bike rack? Before you consider the type of bike rack you’ll be purchasing, think about how much money you want to put into it. Each bike rack style has a lower-end, cost-effective model all the way up to a high-end model. While a more cost-effective rack isn’t necessarily less safe, it may just take more steps to assemble and install it or be a little more complicated to use. A more important question you may want to consider is are you looking at price versus value? If you’re only an occasional biker, you may not need a rack that has all kinds of bells and whistles. There’s also the question of the different types of biking you’ll be pursuing. Some bike racks are all-encompassing, meaning no matter what type of biking you delve into, the rack will hold it. Some bike racks require adapter kits for different fork mounts or fat tires which will add additional costs to the rack you already have. 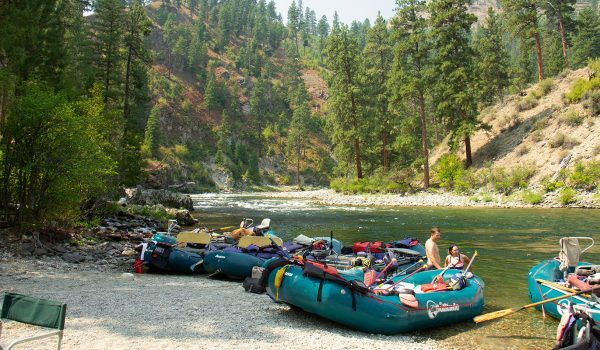 Also, keep in mind that with roof racks, each carrier needs to be bought individually, and this can become costly depending on the type of carrier you purchase. Look closely at your budget and the type(s) of biking you do to determine what to invest in.